In the months since working on their first murder involving the Optical Evidence Program, Detective Veronica Sloan and Special Agent Jeremy Sykes have been trying to solve the rest of the puzzling case. That becomes even more imperative when Veronica receives data from a test subject... who sends her the images of a brutal murder he committed. It’s a race against time as the taunting clues come in. Ronnie and Sykes find themselves traveling across the country, always one step behind the killer who is zeroing in on his real target...in the nation’s capital. It will take all of Ronnie’s ingenuity and every bit of her courage to not only solve this crime, but the one that’s haunted her for months. Especially because, this time, she’s the target of a killer’s brutal rage. The second (and possibly final?) book of the Veronica Sloan duology was just as fast-paced and exciting as the first. Don't Ever Stop turns the murder mystery around this time, and rather than seeing the crime committed via the victims' eyes, now the killer has sent his own O.E.P. photo files, showing our detective the murder he committed. A lot actually goes on in this book, picking up where it left off with an unsolved murder case from Don't Look Away, while giving us a whole new murder mystery to follow. And it isn't until the end that all the loose ends start tying together, in an actually quite clever way. It took a little while, but I DID manage to figure out the ongoing mystery lurking in the background of this second book's main conflict. Surprising twist, yes, but pretty well-outlined, truth be told. I guess what bugged me the most about this book (and even the previous) was the lukewarm romance. It lacked chemistry, even if Veronica and Jeremy were two mature adults with great teamwork skills, witty banter, and an angst-less relationship. They were a wonderfully perfect couple... they just lacked chemistry, whether in bed or out of it. And then there was a triangle between them and Veronica's PD partner, Mark Daniels. I found it quite unnecessary, and while it was pretty subtle in the first book, handled well, I thought it just needed to be laid to rest at the end of the first book. Bringing the situation back again in this second book felt like a deliberate attempt to create conflict, and, once again, unnecessary. Especially since nothing really came out of it that was significant to either the plot or the character interactions, or even the romance. While the main criminal mystery in Don't Ever Stop was well executed, the ongoing background mystery felt a little detached. And also too open-ended for my liking. Sure the mystery was solved, and a lot of secrets got revealed. The resolution was depressing, and at the same time, it felt unfinished. It makes me wonder: Is there going to be another book? Or is this it and we're going to leave it at that? Because while there is obviously potential for another book, I'm not sure I know how the rest of the series would proceed from here on out. Maybe things will become more chaotic and Leslie Kelly will try her hand at a dystopian. Who knows? I mean, we've got mad scientist experiments gone wrong, uber government restrictions, and now the creators of the most advanced technology in this world are both dead, with a lot of beta-testing yet to be completed. It reeks of possible "world spiraling out of control into another trendy dystopian trilogy." Overall, enjoyable and entertaining. Just not what I'd expected from Kelly after other books I've read by her. 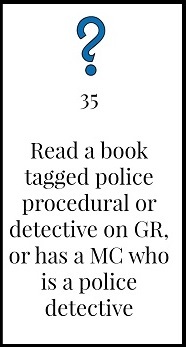 MC is a police detective.